Last semester, a group of Parsons students enrolled in a School of Constructed Environments class called “Soft Fab,” spent weeks growing Mycelium, the network of vegetative fiber for fungi that produce mushrooms. Since the growth of Mycelium is dependent on having just the right amount of moisture and keeping out the cold, several students chose to grow the fungi in their bathrooms, on their living room heaters. or under their classroom studio tables. The purpose of the exercise was to create a soft healthy material that could be utilized to mitigate the ambient noise in the SCE conference room. In 2017, Mycelium tiles had been successfully used with other materials like cork by the Healthy Materials Lab in their Hush Room project to help create quieter rooms for SCE. 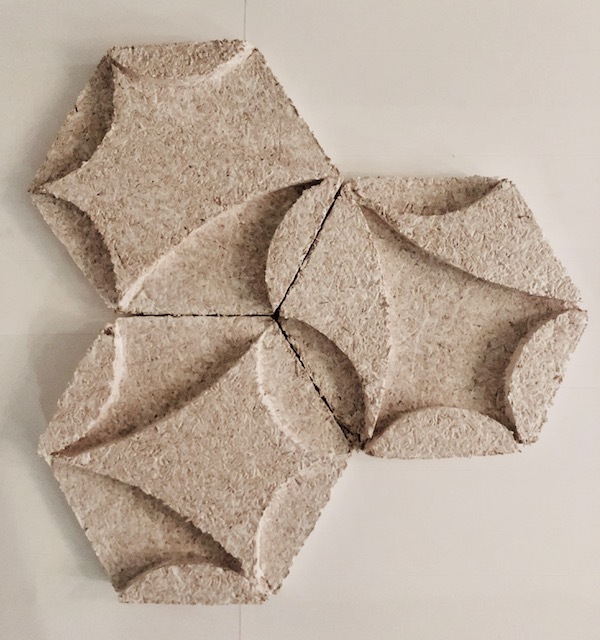 “The goal of the course was to introduce students to compostable soft materials used in interiors, as well as develop digital and physical skills associated with the making of soft interiors,” Khew said. The idea to develop the class came from what Khew says was a need to for a curriculum where soft materials could be the focus. Helping the class to learn the intricacies of growing mycelium was Andrew Olesh, the outreach coordinator for the NYC Compost Project at the Queens Botanical gardens. Olesh gave the class a “mycelium 101 lecture” on how to extract spores and the keys to growing and keeping mycelium alive. It can take from one week to one month to grow the fungi and the longer the mycelium grows the stronger the panels become. “He joined us as guest critic for the finals and was very encouraged by how the students managed to use his lessons on mycelium to design and fabricate wall and ceiling panels out of mycelium, Khew said about Olesh. Another guest lecturer who brought decades of experience to the class was John Storyk, an acoustician and founder of WSDG, an architectural acoustical consulting firm. Storyk gave a lecture on the science of acoustics and how acoustics affects space and how form can affect the absorption and diffusion of sound. Famously, Storyk is known for his work designing Jimmi Hendrix’s Electric Lady Studios and NYC’s Jazz at Lincoln Center. In addition to the mycelium project, which was the third and final project of the semester, students used paper and cardboard for their first project which was then recycled as a base/food for growing mycelium. Project two required students to work with 100 percent wool felt.